After the excitement of the first twenty four hours in Malaysia where we achieved a lot and slept very little, we had a few relaxing days at Pete and Ghill’s place just south of Kuala Lumpur, catching up on sleep, trying different food and getting used to the heat (and sleeping under air con all the time. I find it takes some adjusting). 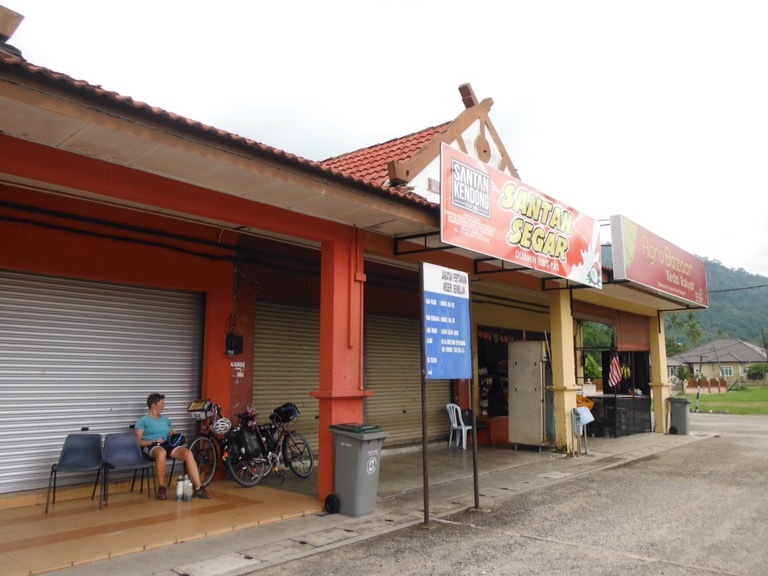 As our passports were with the Chinese embassy for a week (we’d managed to time our visa application with the Chinese New Year holiday, unlucky) we decided to ride to Malacca and back, a popular town south of KL so not on our onward route. 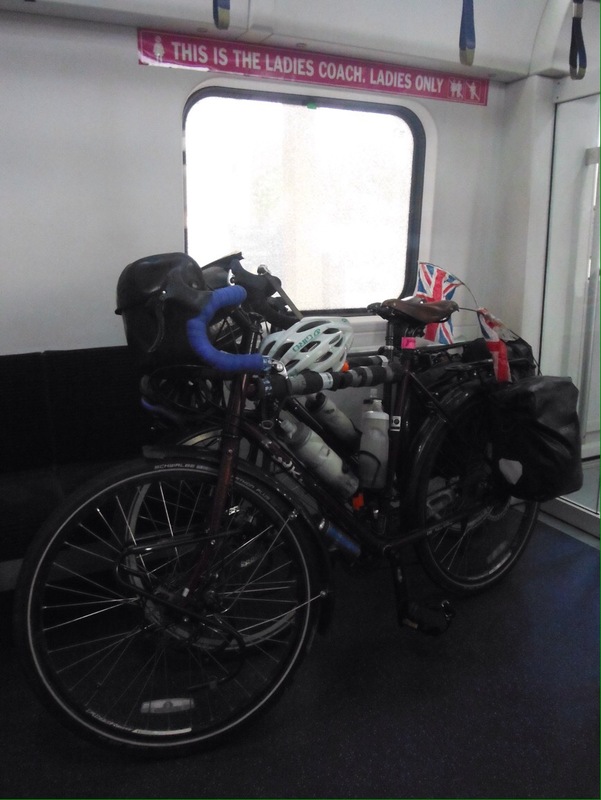 As we were returning to KL we could leave everything we didn’t need behind so set off with only two small panniers each and felt like we were riding carbon road bikes. 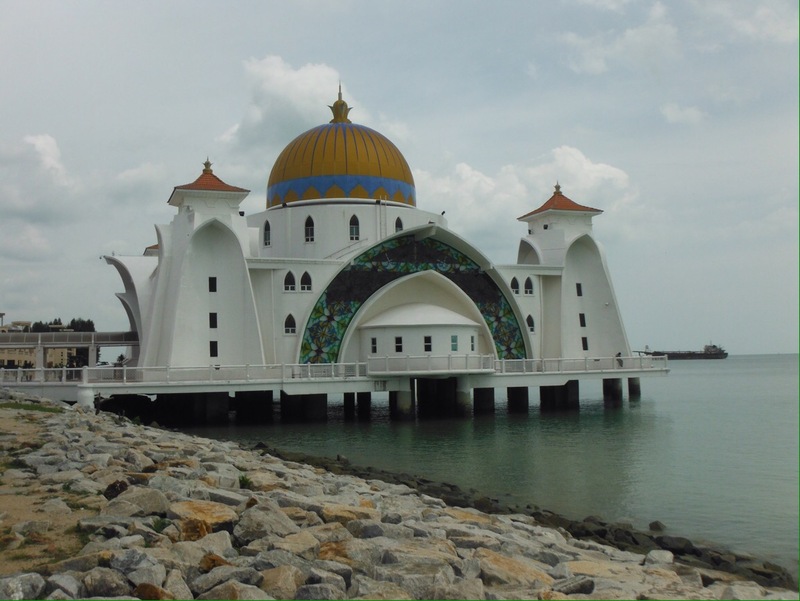 It was 110km to Malacca and our first test of riding in the heat, and it nearly wiped us out. The sun wasn’t as strong as in New Zealand but the humidity is high and as soon as we carried our bikes out of the house we were dripping with sweat. I didn’t find the riding too bad, as long as you’re not riding uphill there’s the breeze you create for yourself, but as soon as we stopped at traffic lights it really hits you. It’s like standing in front of an open oven door. Standing still, I thought I could feel insects crawling on my stomach but it was just sweat rolling down. And my back. Nice. And at traffic lights there’s the heat of car engines and the exhausts of the hundred mopeds around you to add a few degrees to the temperature. We stopped several times for food or cold drinks. 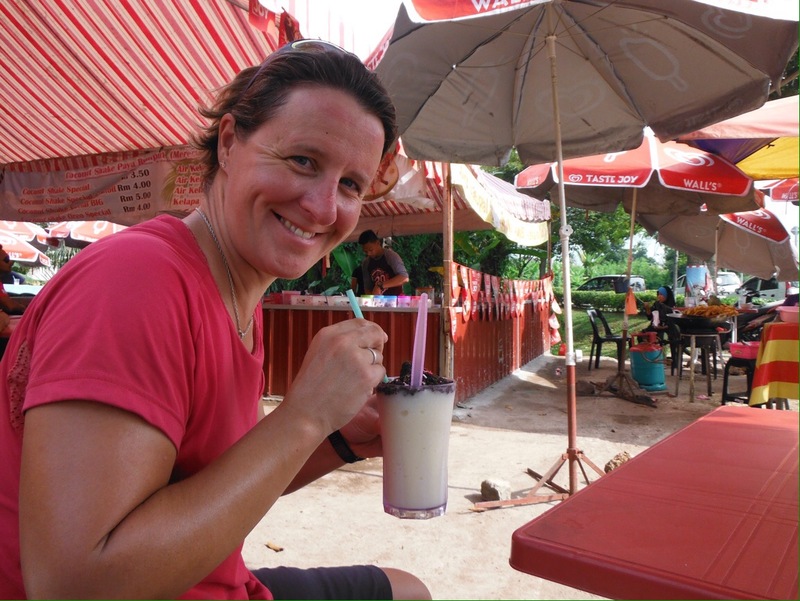 At the 95km point we were particularly weary, after not riding much for the last couple of weeks it was quite a struggle in the heat, so we had a well timed coconut shake stop and mustered up some energy from somewhere for the final push. The roads hadn’t been too busy all day, we even rode on a toll road for a bit for the first time ever but nobody batted an eyelid (a police motorbike went past and gave us a friendly toot), the road was smooth with a wide shoulder and low traffic, but the last 15km into Melacca at rush hour were pretty bad. The only bright spot was stopping at Tesco and buying a packet of custard creams for the first time since leaving England. We arrived in Malacca exhausted, soaked in sweat and starving. Luckily an Indian restaurant was two doors down from our hostel and we ordered tandoori chicken, paneer butter curry, nasi lemak (a rice dish), extra veg, extra rice and a couple of naan, and just about squeezed it all in. With drinks this feast came to just under £5. 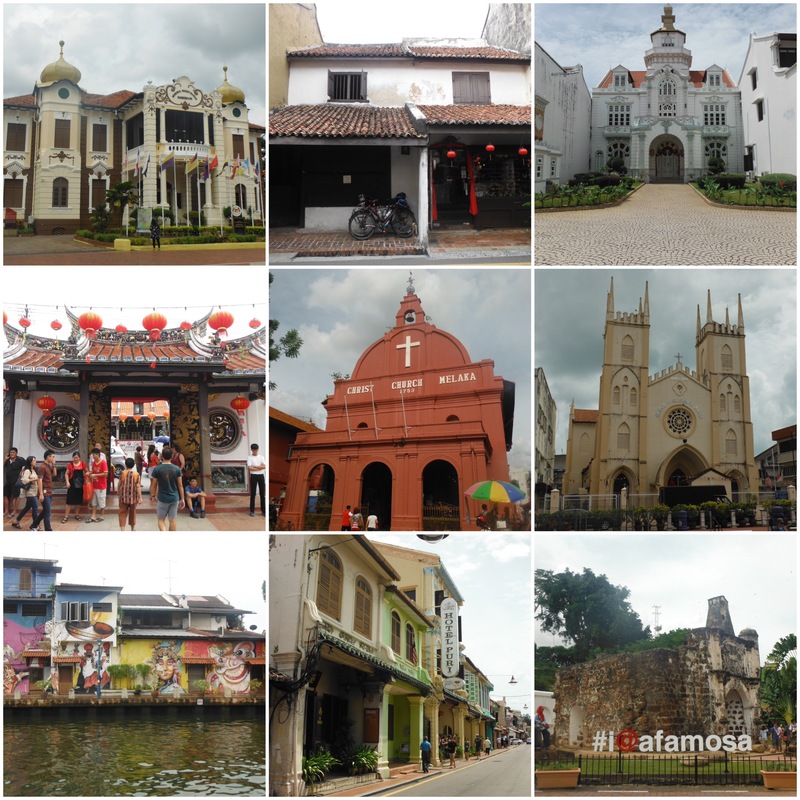 Malacca had enough going on to keep our interest for a couple of days, but we didn’t overdo it. A lot of time was spent reading the paper (there is an English version, we haven’t got that good at languages), eating anything we fancied and acquiring an addiction to Malaysian tea (it come with sugar and condensed milk and tastes amazing). 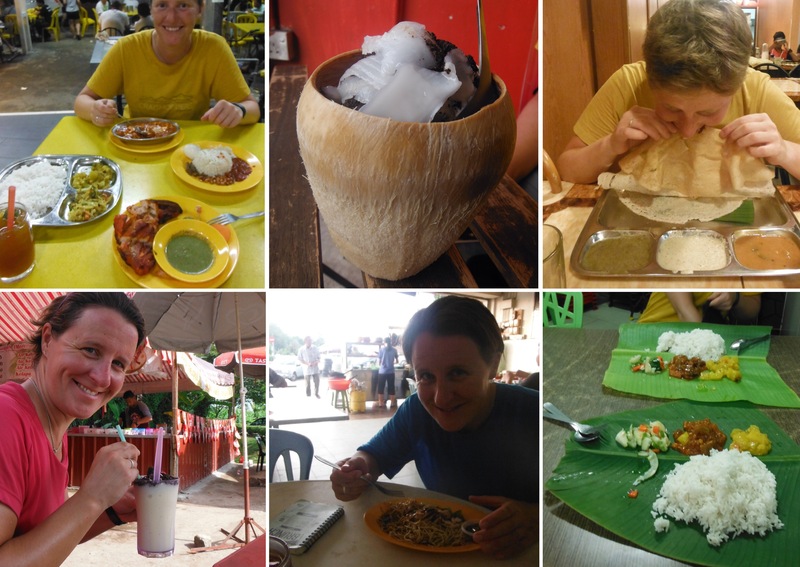 The curry served on a banana leaf was a particular highlight. 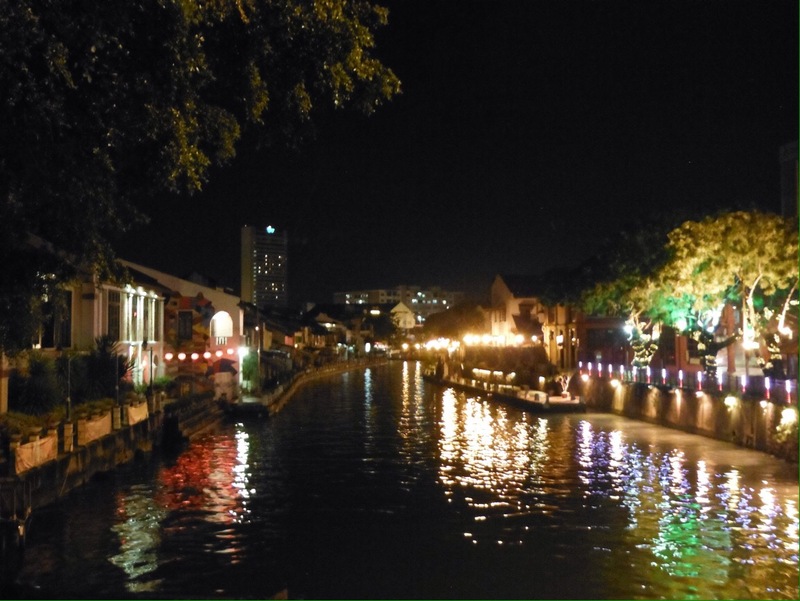 Malacca has experienced British, Dutch and Portuguese occupation and also has lots of Chinese and Indian settlers so there is a real mix of buildings and architecture. We didn’t fancy riding back the exact same way and any other route would be more than a day’s ride so we took a train for half of it. KL trains have ladies only carriages, though this rule seems to only be loosely followed. It depends on the presence of a strong willed woman to banish any men who try to enter the ladies carriage (which we have seen on a few occasions). Otherwise men wander on aimlessly, sometimes sitting right under the ladies only sign. It’s a nice idea that worked about 50% of the time from what we saw. Back at Petes we had another day in the city picking up our passports – and they were handed back to us with Chinese visas inside. Despite not having any tickets booked into or out of the country the visas were granted. Next challenge, Russia. 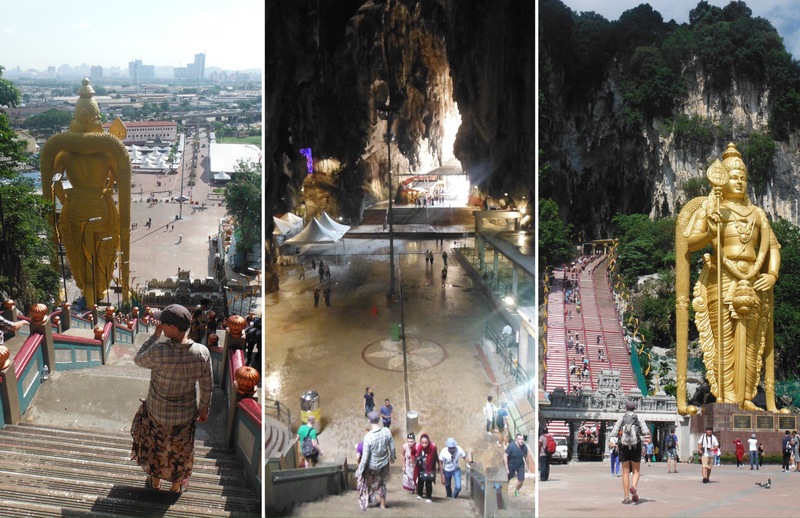 To celebrate we spent yet more time on a train and visited the Batu Caves north of KL, huge limestone caves with Hindu temples and crazy decor inside (and a huge gold statue outside). Climbing over 250 steps was even more sweat inducing than cycling in the heat, but it was worth it. Passports in hand it was time to finally leave the comfort of friends and hit the road proper, with all of our panniers this time. Luckily it’s pretty flat around the peninsula (we had no intention of going into the hilly interior, riding uphill in this heat would be no fun at all) so the riding was not too taxing. We were heading north for Thailand, via a few west coast island stops. 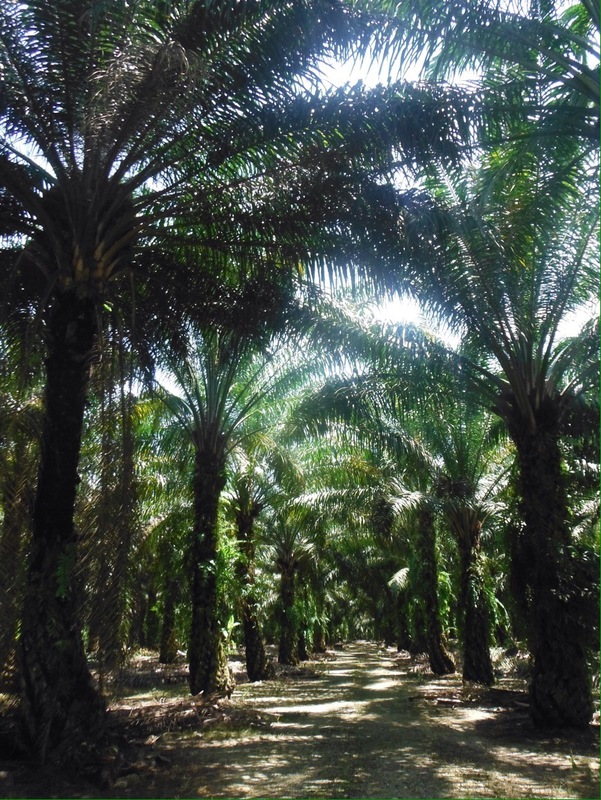 The scenery comprised mostly of palm tree plantations, for palm oil. I do love palm trees, I think there’s something quite exotic about them as a Northern European, they are always associated with holidays, and not just any old holiday to France or wherever but to somewhere considerably warmer and far away. But after a few days of riding alongside them, they lost their novelty a bit. Luckily we passed through towns regularly enough which are interesting. 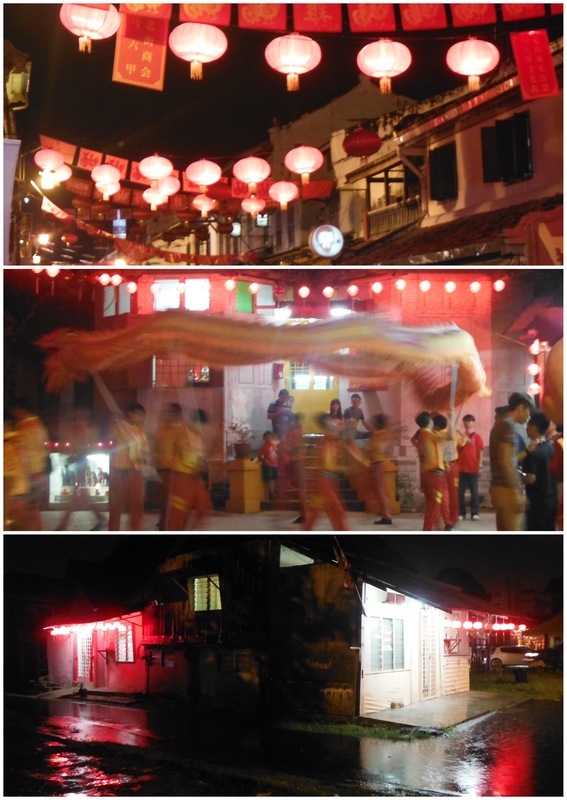 These are not tourist towns, but places where people live and go about their daily activities. The towns that visitors would normally bypass on a bus or a train. 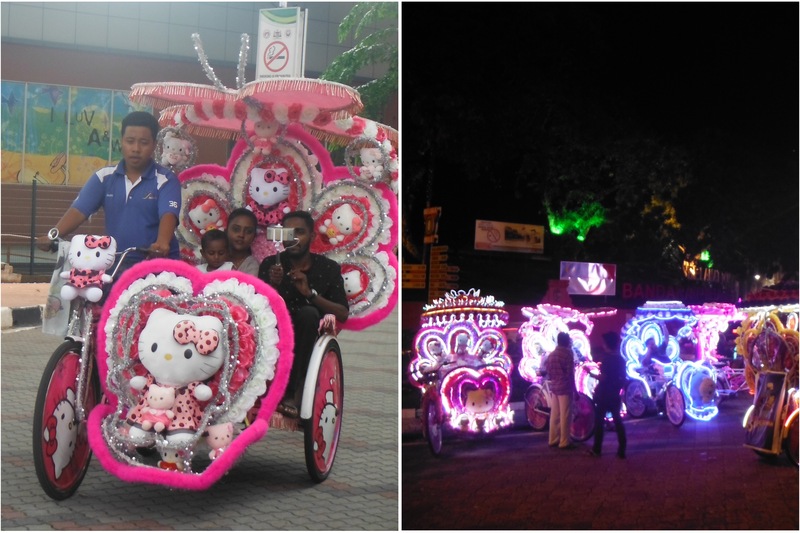 We spent our first two nights in the towns of Tanjong Malim and Teluk Intan, not mentioned in any guide books. 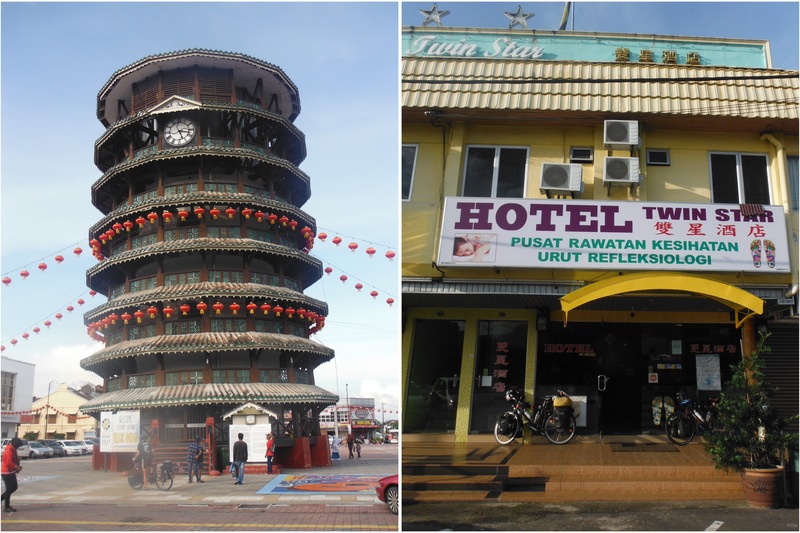 We were pleased to find cheap hotels with air con in both and the leaning tower of Teluk Intan. You learn a lot about a place by riding through on a bike – there’s enough time to take notice of the little things. The moped repair shops, the washing machine repair shops and the sewing machine repair shops. The old men sitting drinking tea, the children playing, the moped riders carrying anything from several children to wheelbarrows to strimmers. The pregnant cats (I have never seen so many). The holes at the side of the road you could just fall down. The fruit stalls selling things we have never seen before. The numerous cafes offering different things at different times involving a lot of guess work and welcome shade. 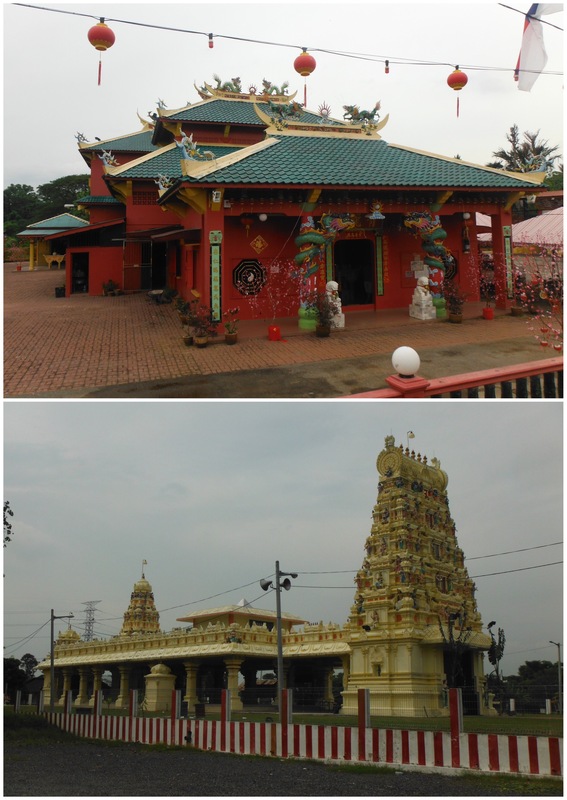 The many mosques, Hindu, Chinese and Buddhist temples. 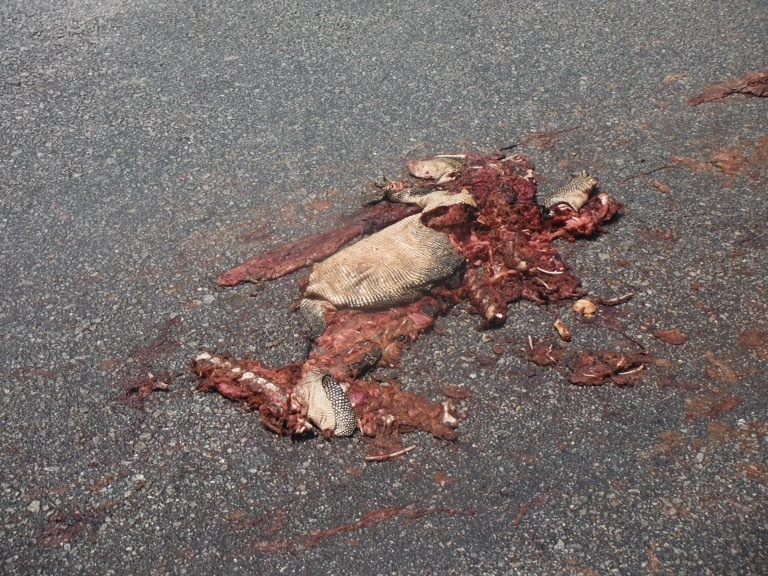 The lizards squashed in the road (and the odd live one crossing in front of us). It’s all new to us and we love it, it’s great fun. The actual cycling here is pretty good. The scenery hasn’t been spectacular, but the drivers are fairly considerate (there are so many mopeds on the road there seems to be a certain level of tolerance for slow vehicles). Road surfaces are mostly good. On the whole,the road experience is an improvement on New Zealand. But everyone stares at us. Properly stares. This hasn’t really happened since Southern Italy over a year ago. Moped riders in particular slow down and stare, their eyes not leaving us as they ride past. This results in a particularly impressive skill of rotating their heads almost 180 degrees to be able to keep staring when they are in front of us, and somehow maintaining forward control of their vehicle. Most truck drivers that pass hoot their horn and wave at us. Cars with families in the back do the same and there are often several hands hanging out of the back window waving as they pass. Kids by the side of the road stare, we wave, they look even more confused. Who are these people with strange coloured skin, eyes and hair? It’s not surprising really. It would be like someone with green skin, pink eyes and red hair riding an unidentifiable object along Leicestershire roads. Or a driver and his Hello Kitty trishaw cycling in Bradgate Park. People would stare. So it’s ok. It’s strange to think that even in SE Asia, well set up for the tourist, we can ride through towns on our bikes where white people are a rare occurrence. We are getting used to being the only white faces in a restaurant, on a train, in a park. But it’s not a problem – on the whole people are interested, welcoming and want to speak to us (the level of English here is very good which makes life easy). Despite the sweat, it’s all fun so far. Thanks to Pete and Ghill, and my stylist.